A bit of data you might find interesting: research firm Global Market Insite recently found that 42% of Americans are willing to spend more money on products labeled environmentally friendly or organic. And, according to the Natural Marketing Institute, over 70% of consumers are more likely to buy products/services from companies they know are mindful of the environment; and 50% say this kind of concern makes them more likely to buy a company’s stock. 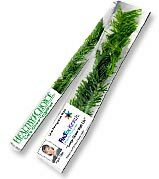 Biodegradable bookmarks and information cards that “bloom” when planted can highlight your brand or company’s message. Detachable business cards or coupons can be kept for long-term reference or to drive sales. Pencils made of recycled materials such as post-consumer currency, peanut shells, or even denim can make your point in an eco-friendly way. Some come in fun shapes like dollar signs and stars – perfect for raising awareness in schools. Organic or recycled cotton turns promotional apparel into a walking billboard to advertise your brand and stress your social consciousness. Recycled Paper business cards, notepads, and envelopes set an eco-friendly first impression. If appropriate, use the recycled symbol subtly to reinforce your message. Finally, look for occasions to highlight your company’s concern for the environment. America Recycles Day (November 15th) and Earth Day (April 22nd), are two dates you’ll find with many local festivals, school events, and media outlets for involvement. If you’d like help planning cause-related marketing campaigns or want to ensure that all your promotional programs include an ecological-friendly component, call us at 708-478-8222 or send us an e-mail. We’ll turn your message environmentally green while making sure the returns are green with cash!